The Palestine Liberation Organization (PLO) was established in 1964 as an umbrella organization for the various Palestinian armed groups, with the explicit aim of achieving, through armed struggle, the "liberation of Palestine" from "the Zionist Entity." The West Bank and Gaza, occupied by Jordan and Egypt respectively, were at this time not targets of the PLO's struggle for liberation. In the 1960's, with Egypt's loss of Gaza as a base for guerilla operations into Israel, Jordan (the West Bank) and the Syrian Golan Heights became the preferred launching grounds for attacks on Israel. Israel reacted with attacks of retribution across the borders into Jordan and Syria. In 1966 the Syrian attacks on northern Israel from the Golan Heights intensified, and in the spring of 1967 the armed clashes between the two countries escalated further. Fabricated Soviet reports of alleged concentrations of Israeli troops near the Syrian border made the Arab leaders step up their threats against Israel, and on May 15, 1967 the Egyptian president Nasser ordered his troops across the Suez Canal, into the Sinai Desert. In the following days Nasser expelled the UN peace-keeping force and reimposed the blockade of Eilat. after the fall of the city i 1967. Israel sought support for the lifting of the blockade with its Western allies, but was rejected. The Israeli Prime Minister Levi Eshkol stated in a speech that Israel did not seek a military confrontation with its Arab neighbors. With Israel completely isolated, Jordan and Iraq joined the Egyptian-Syrian defense pact, while several other Arab countries promised support for the coming war against Israel. Nasser declares that the Arabs' objective was the complete annihilation of Israel. attacked from all sides, the Israelis chose to strike first. On June 5, 1967 Israeli warplanes bombed Egyptian airfields, and in a matter of a few hours eradicated almost the entire Egyptian air force. Israel appealed to Jordan to stay out of the fighting, and promised that if it did, Israel too would refrain from attacking Jordan. 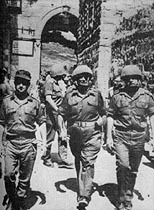 after the Six Day War in June 1967. But when the Egyptians reported of their allegedly successful attack on Israel, Jordan that same morning initiated a massive shelling of West Jerusalem and other Israeli population centres. Syria bombarded northern Israel from the Golan Heights, and Jordanian, Syrian and Iraqi planes attacked other Israeli targets. Israeli jets were dispatched against Jordan and Syria, and quickly destroyed both countries' entire air forces. Left completely without air support, already on the first day, the Arab armies were doomed, and within only six days Israel conquered the Gaza Strip, the Sinai desert, the Golan Heights and the West Bank, including the Old City of Jerusalem. 1967 - UN Resolution 242 and the "Three Noes"
In the wake of Israel's overwhelming victory in June 1967, the United Nations Security Council on November 22 the same year adopted resolution 242, setting the guidelines for future peace negotiations. The resolution called for a peaceful solution, negotiated between the parties and based on the following principle: Israeli withdrawal from an unspecified part (to be negotiated) of the territory occupied in June 1967, in exchange for which Israel's neighbors must recognize the Jewish state, guarantee its security and respect its borders. Israel accepted resolution 242, having from the outset shown willingness to negotiate a withdrawal from most of the territories in exchange for peace. The entire Arab World rejected the resolution. At a summit of the Arab League in Khartoum, already in September 1967, a resolution was adopted containing the following "three noes": no to peace with Israel, no to recognition of Israel, no to negotiations with Israel. Years later, a number of Arab states have accepted resolution 242, however in a somewhat liberal interpretation, according to which Israel must unconditionally surrender all the territories conquered in 1967. The Six Day War had only just ended, when Egyptian forces started shelling Israeli positions along the Suez Canal. Israel's answer was to conduct air and commando raids accross the canal against Egyptian targets. 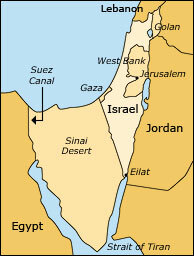 The Soviet Union sent large amounts of advanced weaponry accompanied by Soviet military advisors to Egypt, and in the summer of 1969 Nasser declared a "war of attrition", aiming to inflict on Israel the highest possible amount of losses, and thereby breaking the will of the Israelis to maintain the occupation of the Sinai Desert. But the strategy failed, the crisis escalated, climaxing in the summer of 1970, when Israeli fighter jets downed four MiGs flown by Soviet pilotes. The US pushed for a cease-fire, which then came into effect on August 7, 1970. The War of Attrition ended up claiming several thousand lives on either side of the Suez Canal. leader, Yasser Arafat, established itself in neighboring Jordan. The PLO became an influential power in Jordan, even threatening King Hussein's regime itself, and fighting broke out between the PLO and the Jordanian army. When PFLP, a subgroup of the PLO, hijacked four Western airliners and brought them to Jordan, Hussein had enough, and ordered his army to attack the refugee camps that served as bases for the PLO. 2000 guerrillas and many more innocent civillians were killed. The surviving PLO menbers escaped to Syria, where they received training and equipment from the Syrian army. Subsequently, the PLO established itself in neighboring Lebanon, from where they were able to launch attacks against residential areas in northern Israel. Following an attack by PLO on an Israeli school bus, in which 12 people, children and their teachers, were killed, Israel in May 1970 launched a large military operation in southern Lebanon, creating a 3 kilometer (2 mile) wide buffer zone, which temporarily reduced the Palestinian attacks. Meanwhile, the PLO developed a new way of placing its cause on the international agenda. In 1968-72 Palestinian terrorists directed a string of attacks against international targets. Hijackings of passenger planes became a specialty, but also other targets related to Israel or Jews were attacked. One of the most spec-tacular attacks was the hostage crisis at the 1972 Olympics in Munich, which ended with the massacre of 11 Israeli athletes. to ignore warnings from the Israeli intelligence community that something was in the offing. The country was therefore completely unprepared, when Egyptian and Syrian forces on October 6, 1973, on the Jewish holiday of "Yom Kippur," initiated a coordinated surprise attack on the Sinai Peninsula and the Golan Heights. During the first days of the war, the Arabs made significant progress. But as the Israeli forces were mobilized, the fortunes of war turned. Having halted the Arab advance, Israel succeeded in breaking through enemy lines on both fronts. When the fighting ended on October 25, Israeli artillery was within firing range of both Cairo and Damascus. Dayan, the Yom Kippur War, 1973. Militarily, Israel emerged victorious from the war. But the Arabs had proved that they still posed a real threat to Israel, and therefore regarded themselves as victors. Almost 2700 Israelis were killed in the Yom Kippur War, and after public protests the Golda Meir government in April 1974 was forces to resign. Continue: Chapter 4 - Peace With The Arabs?